Stop sweating the small stuff! Like your messed-up lunch order, or the driver who shouted, “Learn to drive” for no reason. Clinical psychologist Dr. Elizabeth Lombardo says that psychological stress – even in small doses – can cause physical stress… And that hurts our immune system…and diminishes thyroid, brain and heart function…It also increases abdominal fat. Her recommendation? Take a deep breath…And ask yourself, “Am I really going to allow a jerky driver to mess with my health?”…And let it go. How to avoid carpal tunnel syndrome while driving! Did you know that gripping the steering wheel too tightly – or resting your wrists on the wheel – raises your risk, of carpal tunnel syndrome? That’s according to pain management specialist, Dr. Helen Schilling. Her suggestion: Wrap your fingers around the wheel, keep your wrists straight, and keep your arms and fingers relaxed to reduce the tension in your wrists and forearms. Improve your odds of surviving a car crash. First: Tilt the steering wheel downward. This points the airbag at your breastbone, not your head. Most airbag-related injuries occur when the airbag deploys too close to the head, which can cause the neck to snap back. Also: Sit with your chest at least 10 inches from the center of the steering wheel. 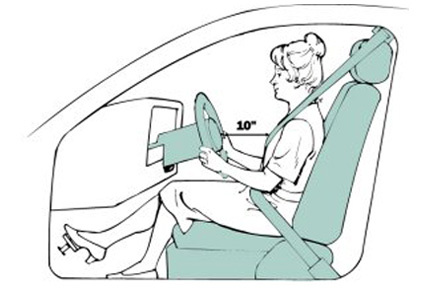 If you sit too close, the airbag may strike you with excessive force in an accident…And to guard against whiplash, you should position the headrest to match the back of your head, not the back of your neck. …and buckle your seat belt, of course!